A 2CD set with a total running time of approximately 100 minutes. Booklet with new essay about Tony, photos taken during the actual interview and a nice UFO-themed front cover pic. In this, his most in-depth interview, Tony tells us how he helped to rescue Thunderbirds and became principal writer and script editor on the remainder of the Supermarionation series and beyond. 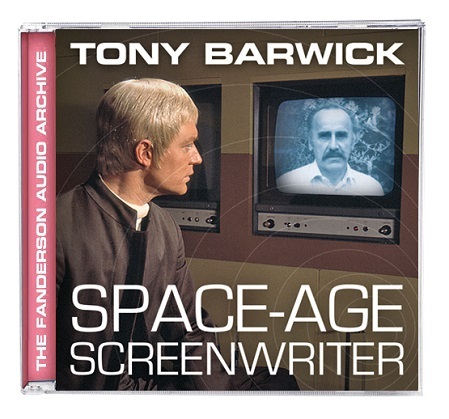 Exclusive to this double CD; hear the inside stories on Captain Scarlet, Joe 90, The Secret Service and UFO. Hear about The Protectors and the action/adventure series of the early 1970s. Hear about Terrahawks and discover the secrets behind Gerry Anderson’s plans to relaunch Thunderbirds in the 1980s. All this and much, much more in an epic interview with one of the guiding lights of Century 21. Recorded in 1985 and released to mark the 25th anniversary of Tony's passing. A true script writing legend, who contributed so much to the shows of Gerry and Sylvia Anderson. An engrossing and fitting tribute. Highly recommended.